Before hiking, backpacking, or camping, people are warned to avoid poison oak. But what should you do if you find it growing on property that you own or manage? Careful removal of poison oak is essential, since many people are allergic to it and can develop skin rashes when they come in contact with it. Effective poison oak removal can be achieved through a combination of control methods. Hand pull or use a shovel or pick to remove the entire plant, including the roots. 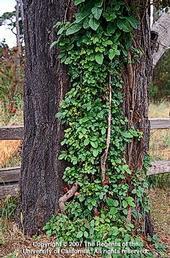 The best time to remove poison oak is early spring or late fall when soil is more likely to be moist.